As corporations such as Google and General Motors tout the benefits of driverless cars, the future of driverless school buses is on the horizon, as well. In fact, Hannah — a self-driving school bus created by Teague, a Seattle-based design studio — debuted as a concept near the end of 2017. Teague researched and designed the futuristic vehicle over a number of months, creating it to hold six kids, allowing a remote adult to monitor and speak to students via intercom, automatically rerouting the bus if needed, and allowing the vehicle to move both backwards and forward. Since the design’s debut, school transportation professionals have debated the merits and drawbacks of such a school bus. The main concern, of course, is child safety, and the need to hire monitors or staff to oversee the buses. Although the buses could save budget dollars, the personnel budget would still remain, and the price to buy these autonomous buses would be higher than most school districts could afford. Although the reality of autonomous school buses remains in the future, school bus contractors and school districts are already beginning to promote several of the benefits. Instead of “no one behind the steering wheel,” transportation professionals are considering similar features that could “assist” school bus drivers while they’re on the road. School buses are already some of the safest vehicles on the road with a design that includes rollover protection, protective seats and high crush standards required by law. At the same time, advances we’ve become used to seeing in consumer cars — such as fast-approaching warnings, collision warnings, blind spot detection, and auto-braking technology — have yet to be implemented in school buses, which tend to lag behind consumer and commercial car updates. Expect to see these in coming years. Similarly, many school districts already have fleet telematics systems that allow transportation staff to track the speed, braking, and routing on school buses. There is now a device on the market that tracks the speed limit along school bus routes and restricts the vehicle to drive only 5 miles per hour — or a certain percentage — over the set limit. Some school districts have embedded GPS technology on their school buses for drivers to monitor their routes and better follow directions and detours. Future technologies will offer voice-guided, turn-by-turn details for drivers to follow while their eyes stay on the road. At this time, Teague doesn’t have immediate plans to build a line of Hannah prototypes, but it’s a good design to consider — and transportation directors are smart to start talking about the technology now. 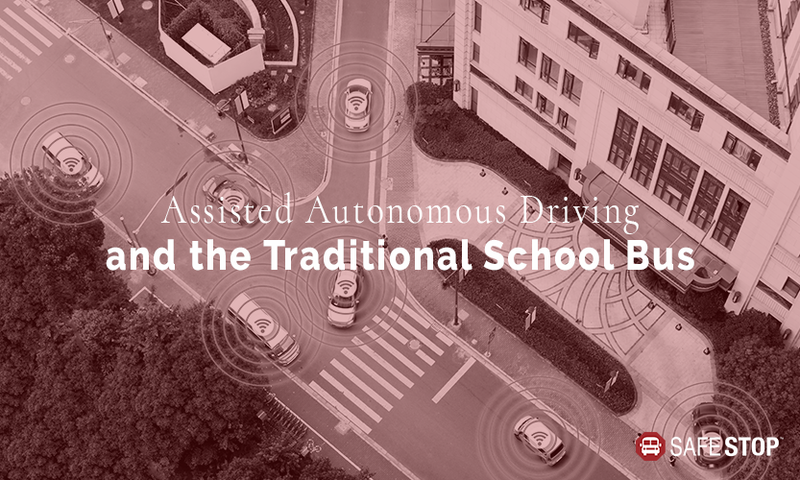 School administrators can play a part by preparing their schools with a fleet telematics system that allows them to incorporate these new technologies in the future. The SafeStop app, for instance, already offers information that estimates drop-off/pick-up times, monitors on-time performance, and tracks school bus braking and speeds. The system links with the school district’s routing, GPS, and student information systems, which sets the district up for more updates as they come — saving budget dollars and becoming more efficient as technology continues to advance forward.